Three Crabs brand fish sauce has achieved a kind of cult status in the American market, being mentioned in various culinary circles as "the" premium brand. This is reflected in the market price which is relatively high. There are also a myriad of copycat brands that have a similar name and label, such as Three Shells, Three Fish, etc. What you see here is the real thing. 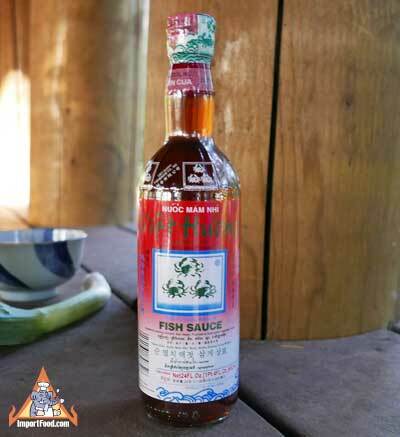 We now offer ultra-premium Flying Lion fish sauce made by Three Crabs. In the September issue of Bon Appetit, Three Crabs was highlighted as a "Chef's Secret Ingredient" and ImportFood.com was mentioned as the recommended supplier. We agree that the taste is certainly excellent, but whether or not the average consumer would notice a difference between 3 Crabs and Tiparos is somewhat unlikely. Packed in a nice 24 oz glass bottle. Three Crabs is a product of Thailand and processed in Hong Kong. Ingredients: anchovy extract, water, salt, fructose & hydrolyzed wheat protein. Typically fish sauce does not have fructose and hydrolyzed wheat protein, and we believe those ingredients give the sauce a subtle sweet flavor. The fish sauce smell is somewhat muted compared to other brands. We also offer four other brands of fish sauce.